Heinz Peter Knes’ photograph “Simone & Bo” is an elegant double portrait with rich coloration. The photograph depicts an adult seated in a large chair clutching a small child. The image is striking for the androgyny of its subjects. The adult is wearing a mauve shirt, precisely buttoned to the neck, paired with simple black pants. The effect is mannish yet effete. This person might equally be a man indulging ‘femme’ or a woman playing ‘butch’. With a soft but square jaw, the face is also poised between masculine and feminine. Hair can be seen above the upper lip, but it is pale, only a wisp of mustache. Short in the front and long in the back, the haircut adds further to this impression of indeterminacy. The problem of gender in the photograph leads to a second point of confusion: What is the relationship between adult and child? Despite the physical contact between them, no visual clue indicates the connection. The photograph eschews semiotic data that might intimate a sanctioned adult-child relationship (mother/daughter, father/son, teacher/pupil, nurse/child). And so speculation festers with ambiguity breeding perverse interpretation. The scenario can only be understood as profoundly ‘queer.’? As it turns out, the photograph is of the artist Simone Gilges with her son Bo and thus a ‘benign’ portrait of mother with child. Why then would the photographer wish to perpetuate such ambiguity? What might be the purpose for this obfuscation? When the ‘truth’ of the image is revealed, that is to say the questions of gender and the relationship between adult and child are resolved, the mystique of the portrait remains. The first impressions, the viewer’s possibly nefarious misconceptions, hang over the image like a ghost. The photograph never fully recovers the innocence of the codification “mother and son”. Importantly, “Simone & Bo” was published in issue number one of Basso Magazine, a publication by the largely male-homosexual collective Basso based in Berlin-Kreuzberg. Within this context of male-homosexual identity, the image proposes an interesting dialectic. 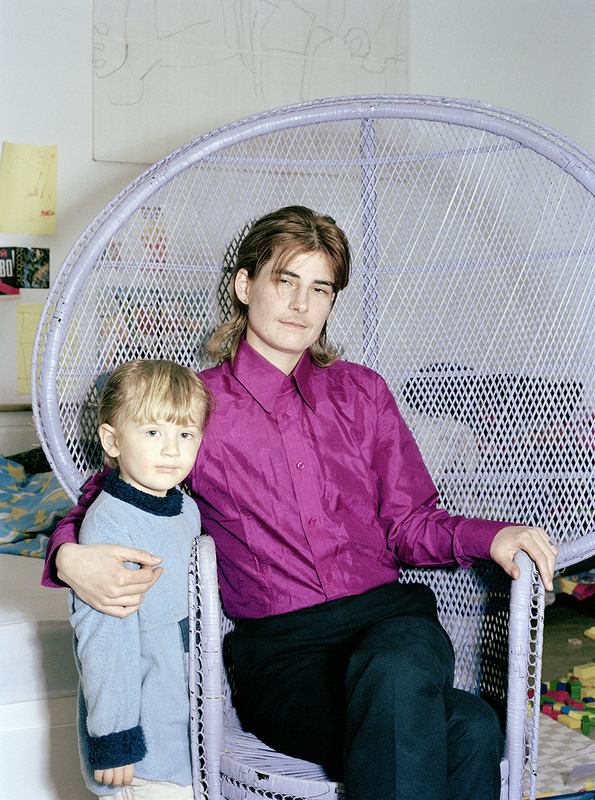 The portrayal of mother and son would, normally, be understood as a conservative position in contrast with the numerous representations of homosexuality found in Basso Magazine. Yet the ‘queerness’ of this image finds the assumed ideas of ‘conservative’ and ‘radical,’ at least in this context, wanting. In Basso Magazine, where homosexuality is the normalized majority, this ‘destabilized’ image of mother and son becomes something quite shocking. The notion of ‘conservative’ or ‘radical’ sexual identity is revealed to be subtler than the rhetoric of any particular interest group?